An allergy is a condition that occurs due to the exaggerated reaction of the immune system following exposure to certain substances. Alternative Ayurvedic medications provide natural allergy relief by controlling the response of the immune system. The substance producing the allergic response are called allergens. The most common allergens include dust mites, pollens, molds, foods, animal proteins, and even medications. However, the patients suffering from allergies develop the symptoms when exposed to different allergens. The allergen that can trigger an abnormal response of the immune system in one patient may not cause any symptoms in the other patients. Though recognizing and avoiding the allergens can help prevent the symptoms of allergies to a great extent, the wide range of allergens and the varying susceptibility of patients to them forms a major obstacle in the treatment of this disease. However, the use herbal medicine for skin allergy can help to prevent the allergic response to a range of allergens by modulating the reaction of the immune system. Ayurvedic treatments for allergies are based on the use of herbs that are considered the best natural antihistamine agents, which can prevent the development of these symptoms. Regular use of herbal natural allergy supplements can help to regulate the functions of the immune system and prevent its exaggerated response to the allergens, thus reducing the frequency and intensity of the attacks of allergic diseases. The allopathic treatments for allergic diseases mainly include the use of medications that block the release of histamine from the mast cells. However, these medications often cause severe side effects such as drowsiness, fatigue, and abdominal pain. Besides these, patients may also be advised to take steroidal medications, which are known to cause serious adverse effects especially when they are used for a longer duration or their use is stopped abruptly. Ayurveda aims to treat these diseases using a herbal natural allergy medicine that can prevent the attacks or minimize the symptoms by correcting the functions of the immune system without causing any side effects. 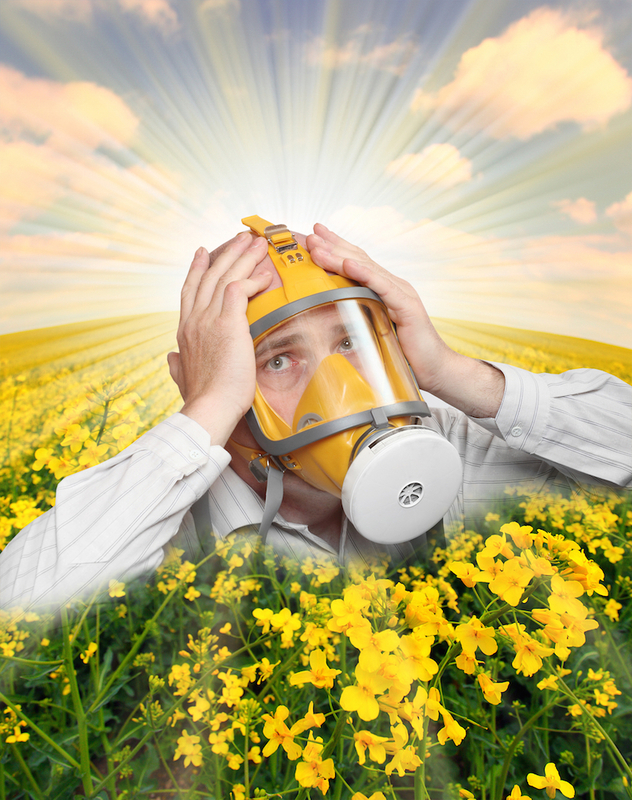 Avoidance of the exposure to the allergen is also considered an effective way to prevent the attacks of allergies. However, most patients are allergic to more than one substance; hence, it becomes difficult to recognize all of them and try to avoid the exposure. Also, this approach needs to be followed life-long. Also, it does not cure the illness or correct the abnormalities related to the immune system. However, ayurvedic treatments can be highly effective in providing long-term relief from this condition by ensuring the immune system does not react to the allergens in an abnormal way. The natural best herbs for allergies given below can help in the management of allergic disorders affecting the skin, nose, eyes, and lungs with their medicinal powers at correcting the underlying immune system abnormalities and the imbalance in the doshas. Gokshura (Tribulus terrestris): Gokshura is an effective remedy for skin allergy. It helps to control the symptoms of contact dermatitis such as skin rashes, itching, and swelling. It is also used to treat allergic rhinitis. Guduchi (Tinospora cordifolia): Guduchi offers an effective allergy rash treatment by acting as an anti-inflammatory agent. It prevents inflammation and corrects the response of the immune system. Amalaki (Phyllanthus emblica): Amalaki provides a rich source of vitamin C that helps to enhance the functions of the immune system. It is beneficial in the management of allergic disease such as allergic rhinitis, allergic dermatitis, and offers an effective peanut allergy cure. Ghritharidra: Ghritharidra is commonly used as a natural pollen allergy cure. It works by reducing inflammation in the airways, especially the nasal cavity. A research done by Sandhya Rani D et al, on 45 patients suffering from allergic rhinitis highlights the uses of Grit-haridra (Tumeric roasted with Ghee). The patients were divided into three groups of 15 patients each. Group A was given Shadbindu gritha Nasya, group B was given Haridrakhanda and group C was given both. After the treatment the patients were examined and group C showed maximum relief in the symptoms. Neem (Azadirachta indica): Neem can be used to treat the food allergies and intolerances. It is also effective in the treatment of asthma caused due to an allergy to pollen. It works by regulating the reaction of the immune system. A research paper published in the semantics scholar highlights the presence of immunostimulatory compounds in neem that enhance the immunity. According to the findings Neem also boosts the body's macrophage response, which stimulates the lymphocytic system, and boosts production of white blood cells. Spleen cells of treated animals showed a significantly higher lymphocyte proliferative response to in vitro challenges. The researchers concluded that neem oil acts as a non-specific immunostimulant and that it selectively activates the cell-mediated immune mechanisms to elicit an enhanced response to subsequent mitogenic or antigenic challenges. Khadira (Acacia catech): This herb can be used to cure food allergies that may lead to an attack of asthma or skin rashes. It helps to cleanse the blood and eliminates the toxins from the body. This helps to improve the resistance of the immune system to the allergens and prevents the attacks of allergic diseases. Anantmool (Tylophora asthmatica): Anantmool is considered one of the most effective home remedies for seasonal allergies. It reduces spasms of the muscles in the air passages and thus, prevents the attacks of breathlessness caused due to asthma. Tulsi (holy basil): Tulsi helps to regulate the response of the immune system and thus, controls the intensity and frequency of the attacks of asthma. A research paper presented by Ravi Kant Upadhyay highlights the medicinal and therapeutic value Tulsi (Ocimum tenuiflorum). Tulsi is traditionally used for the treatment of bronchitis, influenza and asthma. A hot concoction of tulsi leaves is given for immediate relief from cold, sneezing, cough and other allergic disorders of the respiratory tract. Tulsi active ingredients showed anti-inflammatory properties and also play a role in modulation of both cellular and humeral immunity. Its essential oil (EO) can be used to abate the growth of mosquitoes and control malaria. It is a good repellent and can be used for deterring flies, mosquitoes and insects. Ayurvedic believes that several key factors including the inherited tendencies of the person, the strength of his or her digestive fire, and the state of balance or imbalance in the three doshas determine the risk a patient bears to develop allergic diseases. Ayurveda offers an effective allergy cure through techniques that strengthen the digestive fire or Agni, and by improving the state of balance between the doshas. Ayurvedic treatments include the use of herbal remedies for seasonal allergies based on the patient’s primary dosha, or the mind-body constitution. It also advocates following an Ayurvedic diet that eliminates foods, which can aggravate the imbalance between the doshas and even the specific substances to which the patients may be allergic. Ayurveda is considered the best medicine for food allergies as it helps to treat the disease by correcting its root cause, which is the exaggerated response of the immune system. Our Ayurvedic doctors in Melbourne prescribe medications that can help to control the abnormal response of the immune system against allergens. However, these medicines do not suppress the immune system, but enhance its functions to ensure an improvement in the overall health of the patient. Ayurveda Melbourne has a team of doctors who believe in treating this disease in a holistic manner instead of just giving medications to block the release of histamine. The doctors at our best Ayurvedic clinic in Australia also provide dietary advice to minimize the attacks of allergies.